It’s the latest blockbuster that you might not have heard about. A bit of googling tells me that Anurag Singh’s Punjab 1984 had no takers intially. A serious drama in the backdrop of 1984, and that too in the age of YoYoHoneySingh and Jatt-Juliet, who would watch? But if only formulas and calculations of what-works-what-doesn’t could prove right every time, we would have been deprived of some of the best films ever made. Shailesh Kapoor tells us why Anurag Singh’s Punjab 1984 is a must watch, and how it has turned out to be such a blockbuster. Technically, Punjabi is my “mother tongue”. I have grown up seeing my parents converse in the language at home, as well as with friends and relatives. I have even studied Punjabi as a third language in school for two years, till I was shifted from a Sikh school to a “normal” school, post the 1984 riots in Delhi. Yet, I have never watched a Punjabi film in a theatre before this Thursday. Till recently, Punjabi cinema was not a thriving industry. Over the last 3-4 years, the industry has found its feet, thanks to the mushrooming of multiplexes in the East Punjab territory, creating a fertile ground for business. Yet, their cinema has been skewed towards the comedy genre. In a bus trip in Punjab last year, I was subject to watching one such Punjabi blockbuster on video. Assault on the senses won’t be an over-statement to describe the experience. Glowing online reviews of last week’s release, Punjab 1984, forced me to a theatre during my short Delhi trip earlier this week. My interest in Operation Bluestar has grown over the last few years, leading me to read a few books on the subject. That familiarity with the subject, and the presence of Kirron Kher in the principal cast, was sufficient motivation. Even as I went in with high expectations, I was not prepared for the brilliance of the cinematic experience I was about to be a part of. Know the song “Luka Chhuppi” from Rang De Basanti? Punjab 1984 is that song’s little story told through a film. And even though the song featured Waheeda Rehman as the mother, Punjab 1984 can well be described as the story of Kirron Kher’s character in the same Rang De Basanti, converted into a full-length feature film. A mother-son story set in the aftermath of Operation Bluestar, Punjab 1984 has a grammar that’s uniquely matter-of-fact. It does not attempt to commercialize the subject, and equally importantly, it does not do the reverse either – of trying to be an off-beat film that demands to be taken seriously. As a result, what we get is a human story, laced with human situations and dialogue, directed with a free spirit that blends entertainment with sensitivity effortlessly. Director Anurag Singh has directed some of those mindless blockbuster Punjabi comedies, one of which I encountered in the aforementioned bus trip. With a solid script and a superb starcast, he comes into his own with Punjab 1984, delivering a knockout performance at the helm. I hadn’t heard of Diljit Dosanjh till a week ago, though I now realize he has sung a few Bollywood songs as well. 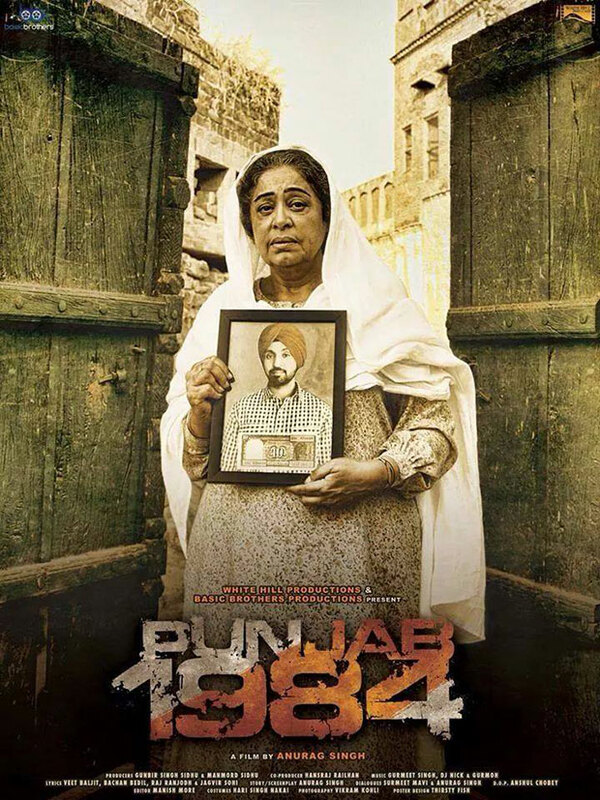 Kirron Kher is in top form, at home with the language and the culture, and yet, Dosanjh manages to live upto her caliber in the role of her son, played with a sense of raw believability that’s rare to film these days. There are at least half a dozen moments in the film when you struggle to hold back tears, when emotional highs are delivered through a mix of fine writing and good acting. And unlike Gulzar’s Maachis, the film does not confuse the issue of terrorism, and leaves the audience with a clear message that’s rooted in reality and morality together. Of course, without a hint of being preachy at any point. The end credits blend the real into the reel. Not a soul moved in my half-filled theatre till the screen had turned absolutely black. I last remember going through that experience in Taare Zameen Par. Punjab 1984 is set to cross the 10 crore mark, which remains a magical figure for Punjabi films, much like 150 or 200 crore for Bollywood. It’s been four days since I watched it, and I’m still wondering why an industry more than 20 times in size not produce such films, at a rate more than once or twice a year. And by “such films”, I don’t mean this exact film, but unconventional subjects where human emotions are treated as, well, human emotions. I know that we are in an age of instant gratification and the youth drive cinema choices at the studios these days. But surely, there can be more variants (not versions) of A Wednesday or Queen. Surely, there’s a market. At least, there is no evidence that there’s not a market. If “regional” cinema like Punjab 1984 is needed to shake up a national industry, then so be it. But hope the shake-up happens at some level. No place is a bad place to learn from. Go and watch Punjab 1984 in a theatre if you can. Even if the language is entirely alien to you, the universality of emotions will cut through to you, right across the screen. And great performance can be heard, even when you don’t understand a word. No mention of Pavan Malhotra’s cracker of a performance! Its clear, the film deals with a subject that’s emotional for the author. I, however, won’t call this review objective. But still this film is something that was long due. nice post shailesh agree with you 100 percent of the state of affairs in mumbai film industry. but off late the regional films have started making a mark. the major regional flicks to watch out for are marathi (vihir, fandry,baalak paalak,gabricha paus etc) and tamil follow the basic rule of indian films lower the budget BETTER THE MOVIE ! I could not agree with you more….till date it is the only Punjabi movie I’ve seen in theater and I was more than proud to have chosen this one as my first. In fact, most of our story is the same, being born in a Punjabi family yet not completely at ease with the language (though I can understand)…..and then a few months a sudden connection with the language and the film industry after watching Waaris Shah-Ishq Da Waaris (recommended)….and then hearing about this movie, watching the trailers on a daily basis and the songs….marvelous….I drove my whole family to watch the movie together on the big screen….each and every role in the movie was superbly carried out….actors like Diljit Dosanjh and Rana Ranbir known for the comic talents worked brilliantly in such a genre as well….and to place the cherry on the icing, the song Swaah Bann Ke….one of the most heart-touching songs not only in the Punjabi cinema but Bollywood too…. It is a memorable movie with some memorable moments and awesome acting, A MUST WATCH….!!! !